Snow-covered trees, holiday tunes, decorations everywhere you look — the holiday season is a wonderful time of year. With all the excitement, though, comes some unwanted stress. The family gatherings, holiday parties, and last minute shopping can be the perfect recipe for stress. During this busy month it’s easy to let health and fitness goals slide, too. The combination of these things can take a toll on your mental wellbeing. However possible, it’s important to minimize stress by relaxing mentally and releasing energy physically. Otherwise, we find ourselves eating our stress away instead of working it away. Here are some tips to minimize stress and to help you maintain your holiday cheer this season. Try limiting your sugar intake and avoid hidden calories! What are hidden calories? If it tastes too good to be true, then it is! Remember, a moment on your lips is a lifetime on your hips! Your body is meant to move and be moved. Multiple mood-enhancing chemicals are released by the brain when you exercise. This helps reduce and relieve the effects of stress from occurring. Strive to do some form of movement most days of the week, even if it’s for a short time period. Something is better than nothing! A good night’s rest will help you revive your spirits, ease your nerves, regain your mental and physical wellbeing, and provide stamina for the next day. It’s easier to control your emotions and cope with stressful situations when you’re well rested. Planning ahead is a great way to stick to a schedule and to accomplish as much as you can during your day. Sometimes things don’t go as planned, which can take your ‘to do’ list in a whole other direction and leave you with more tasks than you started with! If something doesn’t get done, it will be there tomorrow. Don’t sweat it. You can only do so much in a day. Try to prioritize your daily tasks, work schedule, holiday events in a logical manner to maximize your time. This is a skill that is very useful and beneficial, especially when coping with stress. any last minute holiday errands! Chocolate – Eating dark chocolate reduces stress hormones by the antioxidants the chocolate provides! So reach for the dark chocolate as it tastes great and is a healthier option! Asparagus– This vegetable contains both tryptophan and foliate, which are very valuable mood-boosting sources. Low levels of these can make you unhappy and irritable. Fish– Our bodies need omega-3s found in fish. It affects our brain chemicals that deal with our mood (dopamine and serotonin). When these levels are low, we could feel aggressive and depressed. Swiss Chard– This vegetable contains high levels of magnesium, which is an important nutrient needed to boost brainpower and increase energy levels. Try to sauté it or include it in an omelet! Coconut– The smell of coconut can slow your heart rate, making you more relaxed. The scent enhances alertness and reduces stress. If you become stressed or are feeling low this holiday season, try to turn to good foods that boost your mood as well as some energizing cardio movements that blast the stress (and the calories) away! To help you manage your winter worries, I have created a 3-week workout series that will help reduce stress and burn extra calories all while energizing your mind and body! The exercises will change every week but the structure will remain the same. We are entering into the final week of this series. If you are just joining in now, please refer to Week 1 and Week 2 for more workouts! You can start at any time. I call this special workout Yoga Flow to Let It Go. Perform this series of yoga-strength poses and plyometrics on your Total Gym to free your mind, experience flowing movements in your muscles, and focus on your breathing! I’ve added a bonus cardio workout day if you have the time to squeeze in extra workouts. This focuses primarily on a yoga flow warm-up and cardio to get a quick sweat so you feel invigorated. Strive to workout more than 3 days per week. The more you can commit to, the better your mind and body will feel. Perform the exercises listed below (Days 1 and 2) on two nonconsecutive days throughout the week. 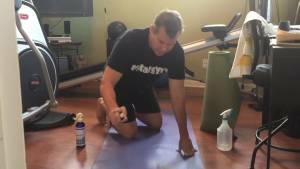 Day 3 is listed as a bonus day with the “Sweat Off Stress” cardio workout. 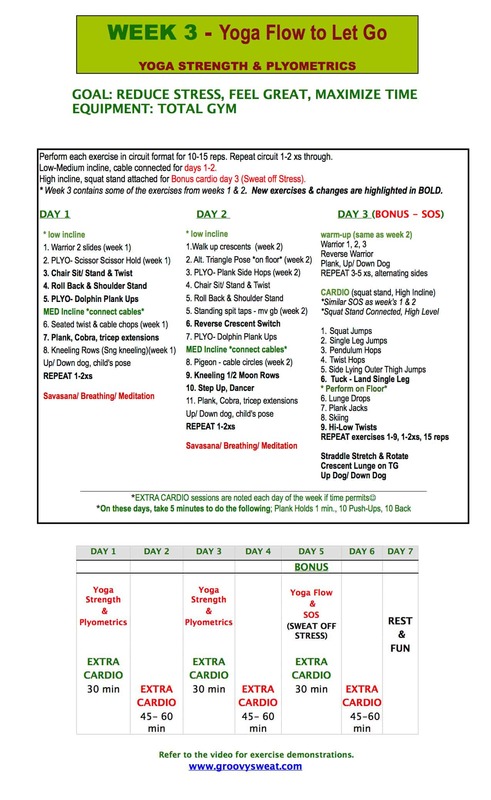 I also added extra daily cardio guidelines for the days following the yoga-strength workouts. Simply follow the weekly plan as best you can and spend more time when you are able! Try not to think of exercise as just one more thing on your to-do list. Make it a part of your routine and a top priority to get moving! Any form of physical activity can help you unwind and can be an important part of your approach to living a stress-free lifestyle! Good luck with the workout and managing your holiday stress. I hope you have found joy, positive energy, and some great exercises that have heated you up during this stressful time of the year!